The Scoop: When Chris Manak found himself single again in 2004, he decided to start approaching women in places he never would have before, including bookstores, on the street, and in supermarkets. After seeing success, Chris started coaching other guys who struggled with confidence when approaching women. Through his Manic Workshops, Chris encourages clients to be honest with women and to try authentic methods. Chris, who is based in Melbourne, Australia, works one-on-one with men in the field and makes himself available to international clients through Skype or text. In 2004, Chris Manak believed online dating and chatting with women in bars were two of the only options open to him. He lacked the confidence to approach women in other situations, but he longed for more freedom in finding dates. Tired of the limitations, Chris took it upon himself to break out of his shell. “I wanted to give myself the confidence I never really had. Eventually, I approached girls — and I was doing it for myself,” he said. As it turned out, women enjoyed talking with Chris, which gave him more confidence than he’d ever experienced before. He had so much success approaching women, in fact, that other guys who struggled with confidence began asking him for advice. By 2008, so many people were interested in his methods that he decided to become a dating coach. Most of Chris’ clients can be described as successful professional men mostly in their early 30s who simply feel like they’re out of dating options. “There’s a cliché that my clients must be lovable losers, but I’ve coached everyone from actors to multimillionaires,” Chris said. Chris’ own dating history is relatable to men who struggle to approach — and date — women who pique their interest. He’s an impactful figure because he’s open about his own challenges. “I always tell my guys, ‘Fifteen years ago, I was exactly where you are now.’ I want them to discount stuff that’s not right for them and find their own way,” he said. Chris, who is based in Melbourne, Australia, has gained a devoted following that can get to know him in a variety of ways. Men are often introduced to Chris through his website or book and, for some, these tools are enough to improve their lives. But others need more individualized attention. That’s why, when Chris takes on a new client, he fully commits to them. He coaches men around the world remotely, via Skype and text message, or in person through one-on-one coaching and day and night workshops. Most of Chris’ clients are like he once was: unhappy meeting women through online dating or by picking them up in bars. Many are surprised that meeting a woman somewhere they often spend time is even possible. But that’s the beauty of Chris’ methods: You don’t need a specific situation or location to use them. They work anywhere and at any time. “If a girl doesn’t want to talk to you, you’ll know right away,” Chris said. Other clients have confidence issues and don’t always believe that women they meet would be interested in them. For those men, strategies for meeting women aren’t enough. Instead, they need to work on self-image issues first. Chris coaches daters through many different channels, including his book, Skype, and workshops. “I’ve coached guys with really serious dating anxiety. When a guy talks to a girl, so much anxiety comes up,” he said. Chris understands that enabling these daters to change their lives — and their self-perceptions — is his most important role. Helping a man value himself more, and recognize why he might be desirable to a woman, is Chris’ primary goal. Sometimes, this kind of self-reflection helps men recognize that they want to change their lives. “Sometimes, I have clients who suddenly quit their jobs. It took going out with me on weekends to realize how much they needed change,” Chris said. Some clients sign up to learn how to meet women, but they end up with a new outlook on life. Chris calls himself a dating coach, not a “pick-up artist.” While his services might seem similar to those offered by others in the industry, Chris preaches authenticity. While Chris does help men meet women, he doesn’t encourage the same behavior he sees from other coaches, including asking daters to be coy, or even nasty, in their interactions with women. “My biggest contributor to the dating coaching field is to make sure each guy approaches dating in his own way,” Chris said. Chris is so set against pick-up artist strategies that he has written a book that encourages men to forget about what they’ve learned. 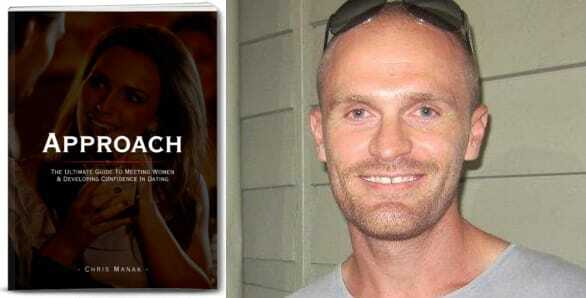 His book “Approach: The Ultimate Guide to Meeting Women and Developing Confidence in Dating” actively aims to deprogram the strategies daters have learned from pick-up artists. After all, most women are looking for the same things as men. Chris tries to reprogram guys who have learned methods from pick-up artists. “Approach” came from Chris’ interest in creating a video course for his clients. While working on the videos, he started writing down his ideas. Those ideas transformed into a step-by-step guide that served as a standalone book. Chris’ straightforward approach and adaptable strategies separate him from other dating coaches, especially those who help men meet women in everyday situations. Chris’ strategy is focused on authenticity. A coaching relationship with Chris may begin with a Skype session in which Chris listens to concerns about meeting women and dating. He’ll ask what’s holding the would-be dater back, and, together, they’ll come up with a plan to boost success. But Skype coaching isn’t the only way he interacts with clients. Chris also provides phone-based support — whether it’s text or call — and workshops for men trying to meet women in the real world. He offers clients the tools to approach women in any situation in which they find themselves. “I have day and night sessions in which I’m out with a client and helping them see the opportunities that are right in front of them — in a bar or a supermarket,” Chris said. Chris offers day or night sessions and workshops to help men learn how to be confident. With a clientele spread around the world, Chris strives to develop more resources for the men with whom he can’t connect in person. He plans to produce more YouTube video guides, as well as engage clients with more remote coaching. Many daters have said they find Chris’ methods useful because they’re accessible and individualized. They also learn that they don’t have to play games or pretend to be someone they’re not. Chris stands out from the pick-up artist pack as a dating coach who helps men stay true to themselves while gaining the confidence to approach women anywhere.